You don't want to miss this!!! We are so fortunate to be hosting an Epic Talk this Saturday (4th July) by Angelo-Wilke Page. He is a young man, who has decided to circumnavigate the Globe N-S and E-W (720 degrees) on human power. This feat is taking Angelo 8 years and we have managed to get him to PMB on one of his refuelling stops. If you are interested in coming along to the talk at Wesley this Saturday please call our office (033-3861386) to book. The cost is only R40, which includes a wors roll, pancake and tea/coffee. If you have a moment please check out his website- it's AWESOME. He has some amazing video's and photo's of what he has achieved so far. I find this so inspiring. 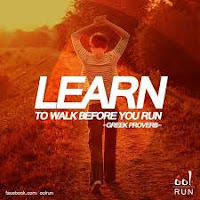 Walk before you can run! However, as someone who is equally impatient and who has had a fair share of broken bones in my life, I fully understand his frustration. We want to get back on track immediately. We get impatient with re-learning how to do a simple task of ‘walking’, but the saying stands TRUE in this case. If he rushes back into trying to run, he will run with a limp. Although his progress may seem faster this way, in the end it will actually slow him down. He will then have to undo all the work in order to rectify the limp. Don’t great frustrated at your lack of Spiritual progress at times. 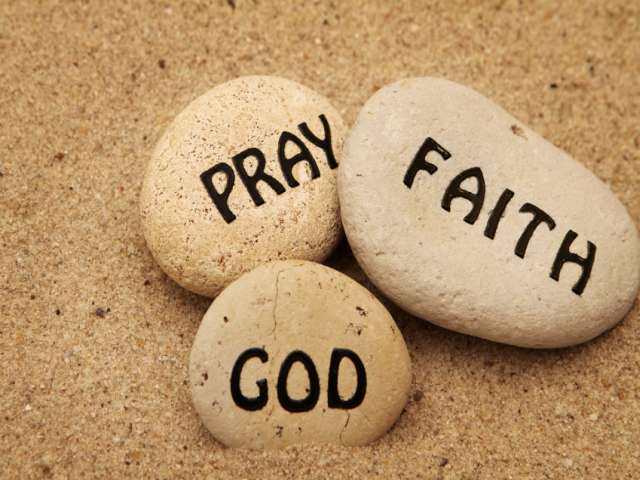 We need to learn to do the basics of faith first, before we can actually do the rest. The province in which I live is experiencing a tough time of late - we are in the middle of a drought. Although Kwazulu Natal is a vast province, and Pietermaritzburg seems to be OK at the moment, the drought will impact us all. When people on our doorstep can't drink water or allow their livestock to drink freely, we should all be concerned. It will not just be the sugar-cane farmers, towns and other industries that will be affected, but we will all feel the knock-on effect soon. ties have suffered through droughts and floods before - so we should all do what we can to restrict our water usage at the moment and to mindful of those in need. Despite the severity of what is happening at this time, I am grateful that God never has to place His Love on some kind of restriction. Can you imagine if God said to us, "I can only love you between 4 and 6pm, three days a week. The rest of the time, I will be loving other people elsewhere!" That would be heart-breaking for us all? We are blessed that Jesus didn't just die for his disciples or for the Israelites, but that the gift of forgiveness was for all the earth. Revelation 21:6 - To the thirsty I will give water without cost from the spring of the water of life. Revelation 22:17 - The Spirit and the bride say, “Come!” And let the one who hears say, “Come!” Let the one who is thirsty come; and let the one who wishes take the free gift of the water of life. Prayer: Let's pause for a minute and pray for RAIN. Ask God to do a miracle and to allow rain to fall over the places that need it the most. We all want to be noticed, or to be the hero who saves the day. Sadly, we won't all get to experience the victory parade or the fan-fare of the movie star. However, we will ALL get a daily opportunity to do something significant for someone else. It may not change the planet, but it could impact the life of someone in need. So, send the email, type the sms, make the call, visit the friend, say 'sorry' or do whatever you feel will make a difference. 1 Kings 17:13 - Elijah said to her, “Don’t be afraid. Go home and do as you have said. But first make a small loaf of bread for me from what you have and bring it to me, and then make something for yourself and your son. Don't delay when you feel nudged to do something for someone else. Whenever people are excitedly waiting for a good friend or family member to arrive, they hang around the door waiting for the doorbell or gate buzzer to ring. 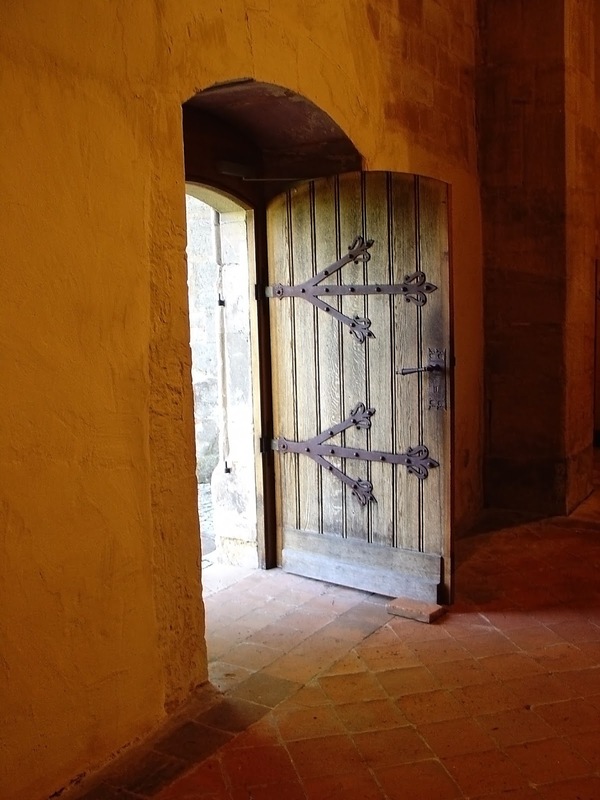 When that moment arrives, the doors are flung open and people rush out to welcome the friends inside. I was wondering if we would do the same if we knew that Jesus was going to show up today? Would we still be waiting excitedly by the door, or would we be a little anxious? I suppose a lot depends on how you view Jesus, doesn't it? I mean, if you have been taught to believe that Jesus will be like the tough school master, then of course you won't be eager for him to arrive. However, if you have come to the deep assurance that Christ loves you and that he wants to be friends with you, then it makes a huge difference! The apostle Paul seemed to have a special relationship with God. He knew that he was not worthy of God's love, yet he had experienced the GIFT of forgiveness and mercy. This made him all the more eager to be with Jesus. What about you today? Which side of the door are you waiting on? I saw a beautiful sunrise this morning from my window. The old naked tree in our garden was silhouetted in front of the orange-red rising sun. It was breath taking. Every branch wrote it's own message against the background of the dawn sky. I was mesmerised and my heart immediately leapt with praise. 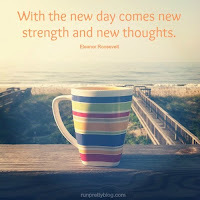 The birth of the NEW DAY filled my soul with hope. Yesterday's pain evaporated in the blink of an eye. 2 Samuel 23:3-5 - The God of Israel spoke. Habakkuk 3:4-14 - His coming is as brilliant as the sunrise. Rays of light flash from his hands, where his awesome power is hidden. Pestilence marches before him; plague follows close behind. When he stops, the earth shakes. When he looks, the nations tremble. He shatters the everlasting mountains and levels the eternal hills. He is the Eternal One! Remember that every sunrise is a reminder of God's great GIFT of GRACE - we have the opportunity to start over today. Turn your eyes to Christ and ask Him to write his name on your heart today. I had the privilege of sharing in a workshop last week on the topic of dealing with having loved ones/friends living far away from us. 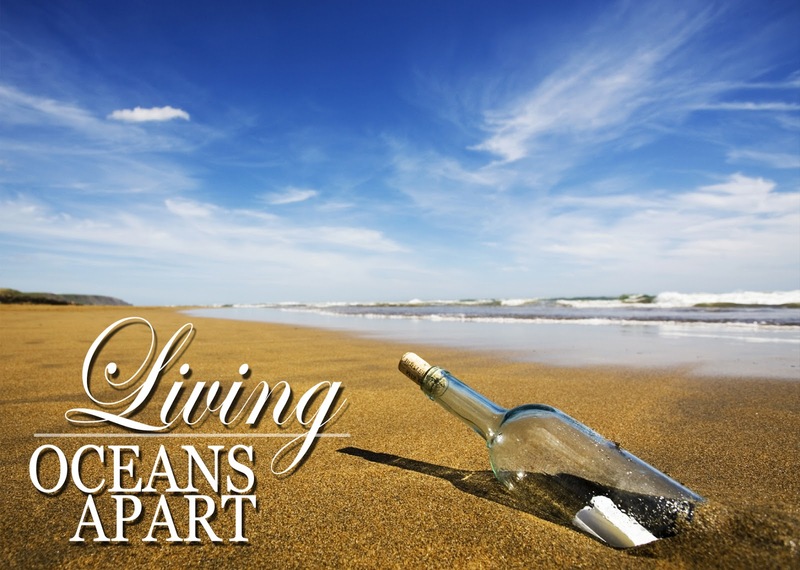 A few years ago I wrote the book, Living Oceans Apart, which deals specifically with this topic. What is interesting is that the emotion attached this topic has not lessened over the years - in fact, for many people, it has just intensified. It was heart-wrenching to hear some of the stories of people struggling through the pain of missing their kids and grandkids. It reminded me that just when we think we are struggling with a particular issue, there are likely many others dealing with the same pain. I kept coming back to the words I read in one of Trevor Hudson's books, where he spoke of every person sitting beside their own pool of tears. Our emotions may be raw and sensitive, but there will always be others dealing with similar hurt and pain. Just remember today that there are others who are"in the same boat" as you. Pray for each other and support each other. We all need a friend to lean on in tough times. 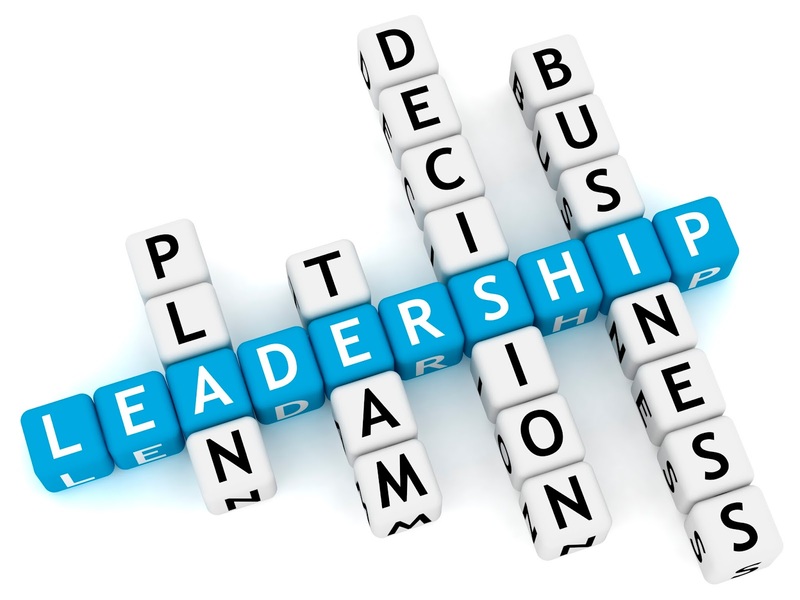 Proverbs 11:14 - Without wise leadership, a nation falls; there is safety in having many advisers. 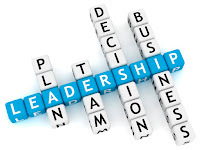 I came across an article in the paper entitled "Seven qualities of a good leader." It made for interesting reading, and the author Barbara White, made some sound comments. As we were reflecting on these qualities, we realised that there are a few crucial qualities missing, especially if one reflects on Godly leadership. Although leadership in the Christian context needs all of these 7 qualities, we feel that there are a few extra qualities that we would love our Christian leaders to display. As you read through the list of Seven qualities, think about which characteristics are missing. Please take a minute to jot them down and email me back - thanks. What would you add and why? 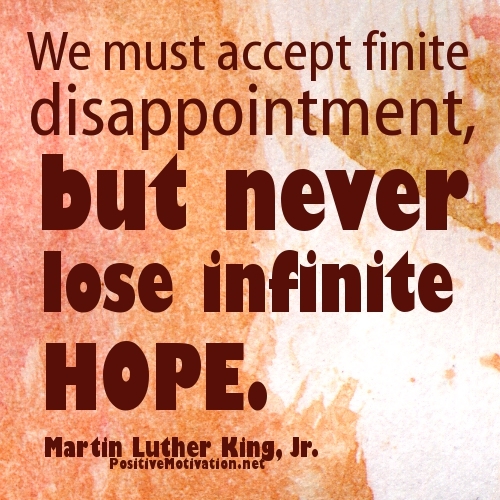 never lose infinite HOPE." - Martin Luther King Jnr. We had a look at "Dealing with Disappointment" in our sermon series yesterday. My friend, Collin spoke clearly about how we can get a 'grip' on disappointment in our lives. We all face this at some stage - broken promises, shattered dreams, hurt feelings, lost opportunities. None of us is immune from this kind of hurt and brokenness. 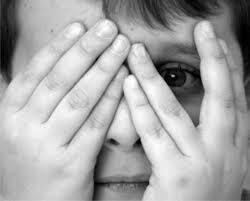 The danger with disappointment is that it threatens to leave us in the pit of despair. We should always remember that with Jesus we can hold onto Infinite Hope. 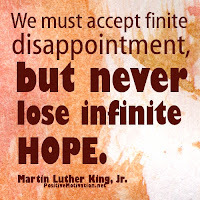 Disappointment may last a while, but our hope in Christ can last for ever. Romans 5:5 - "And this hope will not lead to disappointment. For we know how dearly God loves us, because he has given us the Holy Spirit to fill our hearts with his love." I often reflect on the first exam I ever failed. I still remember it as if it was today. When I was studying towards my BComm, I got 27% for one of my tests - it was a huge shock to the system, but it certainly gave me a wake up call. 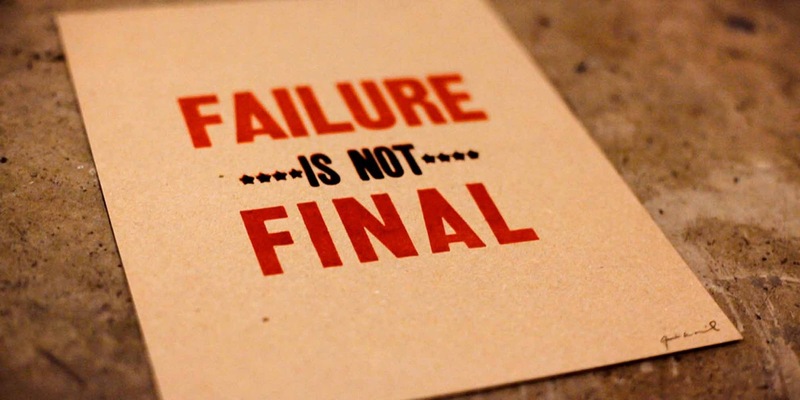 The one good thing that came out of it for me was that I realised that my failure was not fatal (or final). It hurt me, but it never destroyed me. The same is true of the times we 'fail' in our faith. Our sins should never keep us down in the dumps because Jesus has already forgiven us for our sins. It is through his grace that we are given the opportunity to start afresh. So, when you let yourself, God and others down, don't let it stop you from trying again. The quiet ones came out at last. Found courage in their grief. James 3:2 - "Indeed, we all make many mistakes. For if we could control our tongues, we would be perfect and could also control ourselves in every other way." Wow! How often do we struggle to try and discern God's call for our lives, waiting for the writing on the wall, when it could be as close to us as this? 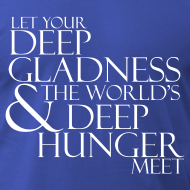 So the very things that bring us joy could be our offering to the world's deep hunger?! For example, we may love music and be skilled in an instrument - perhaps this is what we need to offer the world right now. Or we may have a love of crafts, baking, knitting, writing, poetry, sport, photography - all of these we could offer to the world as our "gift" to a hungry world. Had you thought about that? Don't try and offer the world what you don't have - offer what God has already GIVEN to you. This is what Jesus was trying to explain to the disciples when they were faced with feeding the 5000. The disciples kept thinking of how they were going to get food (or pay for it) from the outside, when Jesus knew that they already had what they needed amongst them. This week we mark the winter solstice in the South Hemisphere - the 21st June will be the shortest day and longest night in the year. Sometimes our lives feel as if we are living through the longest night - what the mystics referred to as the 'dark night of the soul.' It is not anything new - Christians have been experiencing moments of despair for centuries, but this doesn't mean that God is silent or even deaf to our cries. 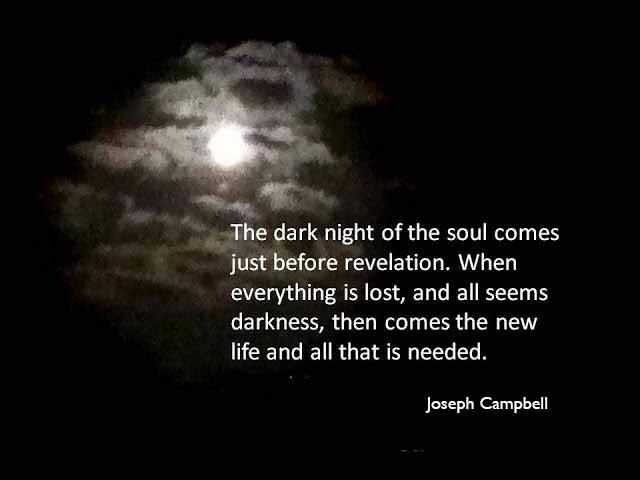 The Good News for all of us is that even in the darkest night of your life, God can still shine through. Every day from the 21 June ushers in brighter sunshine and longer days, until we eventually get to the longest day of the year (in December). With God there is always hope. 2 Samuel 22:29 - "O Lord, you are my lamp. The Lord lights up my darkness." The other day I had the awesome opportunity to try my hand at Archery. My friend, Jacques showed me the ropes and, believe it or not, my first arrow hit the bull's eye. I am convinced it was 'Beginner's luck' and am happy to admit that. 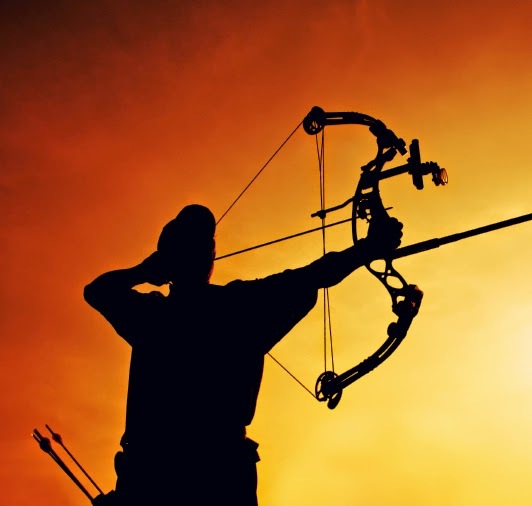 Archery is actually a lot harder than it looks - it is not just simply shooting an arrow at a target. If you have tried your hand at it you will have to agree with me. So I was thinking of the incredible spread of Christianity in the early church - could it have been 'Beginner's luck?' We hear of thousands of people being added to the church, on a daily basis, and the disciples turning the world upside down. This was the first time the group of disciples had the chance to preach the Gospel after the Ascension of Jesus and they did an awesome job. Would you put it down to Beginner's luck? Of course not! It was the perfect timing of God's spirit working through the lives of the disciples. They were willing to trust in the promises of Jesus and God's Spirit used them in a mighty way. As we venture out in faith, we may feel a little like beginners, but we should not despair at this. God will use us to fulfil his tasks if we are willing to be obedient to Him. Acts 2:41 - Those who accepted his message were baptized, and about three thousand were added to their number that day. Making a trip to Israel has been on my "bucket list" for a long time. Until last month I had resigned myself to only being able to go to the Holy Land when my boys had finished University (somewhere near the 22nd Century), but I may well be going in 2016. A friend of mine has asked if I would consider joining him in leading a tour group in May next year - which is amazing. If you have also dreamed of walking where Jesus walked, and reading the Bible in 3-D, then perhaps you should consider joining us on this trip. If you are keen and would like more information about the costs, dates and itenary, then please send me an email (delmelinscott@gmail.com) and I will forward the information onto you. You are welcome to pass this information onto anyone who may be interested. As we celebrate Youth Day (16 June) in South Africa it is nostalgic thinking back to your childhood. I have many fond memories of growing up in South Africa, but I recognise that not everyone has good memories of their youth. What are some of your childhood memories? Please share a memory today - what do you remember about your Youth? I remember the freedom of being able to play until dusk, in the forest near our home. We would fish in the dam, build forts, shoot katties (slingshots) and come home for supper - safe and sound! Going to the "Drive-In" for the first time. Walking down Church street on a Friday evening with the Youth group. Hiring a Video Machine and a video for the evening. Proverbs 20:29 - "The glory of the young is their strength; the gray hair of experience is the splendor of the old." Of course we need to pause today and remember all the children who have had their lives cut short by war, violence, abuse and neglect. Even though our world claims to be the most progressive and civilised generation EVER, we still have to deal with child-trafficking, child soldiers, child prostitution, child headed households and the abuse of our children. What happened in Soweto on the 16th June 1976, should have been a lesson to us as a generation, but sadly we continue to repeat our mistakes over and over again. Every child has the right to be protected, respected and educated. As adults we need to do all we can to honour our young. You may be asking "Would I buy WHAT?" Would you buy a puzzle, knowing that there was a piece missing? 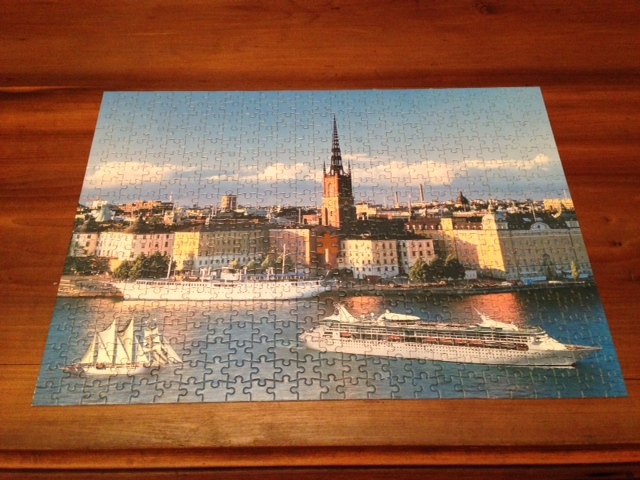 It would have been a pity for the puzzle not to be completed, just because a single piece was missing. Can you imagine if God worked like that with us? What if God said, "I am not going to do anything in Delme's life, because he is missing a lot of things in his character and personality!" That would mean that God would refuse to build anything in anyones life, because we are ALL missing something in our lives. 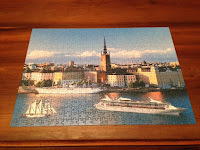 The kids had a lot of fun, in building the puzzle, which they wouldn't have experienced if they had ignored the puzzle. It was a good bonding experience and the joy on their faces was brilliant to see. Which reminds me that often I am consumed by "getting things done" instead of enjoying the process of spending time with others. So, in the end, the puzzle with the missing piece tells me the story of the Gospel - even though God knew I was imperfect, he still chose to do something in my life. That is the miracle of GRACE. 1 Corinthians 1:25 - "This foolish plan of God is wiser than the wisest of human plans, and God’s weakness is stronger than the greatest of human strength." 2 Corinthians 1:24 - We want to work together with you so you will be full of joy, for it is by your own faith that you stand firm. We had the wonderful privilege of sharing in a Spiritual Retreat today. A lot of the time was spent in reflection, silence and prayer, as well as some great food and company. The thing that always amazes me about having these moments away from the chaos of life, is that God always speaks in the silence. 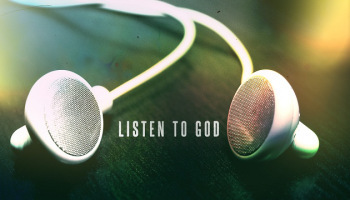 It is not that God doesn't speak in the noise of our lives, but I feel that his voice is easily drowned out. By simply blocking out a few hours in a day, we create the space for God to communicate with us, uninterrupted. There is nothing magical about it - it is purely allowing God the opportunity to share with us. I guess it is the same as communicating with your spouse or a friend. Of course you can chat and communicate in the routine of life, but often these conversations happen at high speed and we don't always listen to what they are saying. Yet, go away for a day with your spouse/friend and you will discover that you can actually talk to each other. Psalm 141:1-2 - "God, come close. Come quickly! Open your ears—it’s my voice you’re hearing! Treat my prayer as sweet incense rising; my raised hands are my evening prayers." You may not be able to take a whole morning out, but I encourage you to find some time to rest in the presence of God. You will be blessed. 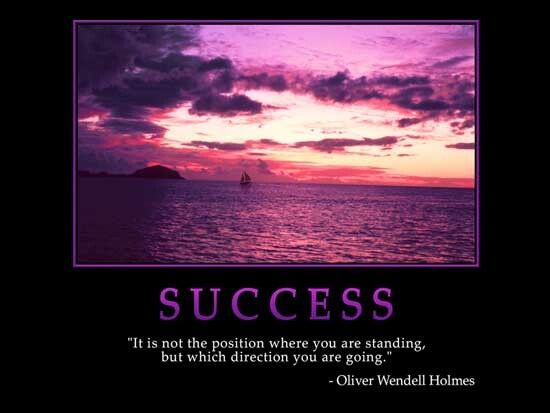 Success - how do you define it? ...success is having a good job, career. ...success is having a sizeable bank balance. ...success is having thousands of Facebook friends. ...success is having a nice home, car, bike. ...success is having the latest gadget. ...success is being promoted to the top of your company. But, is this really success? We know in our heart of hearts that none of these things really count in the end. What good is a fancy house or car, when you have no genuine friends? How does all the money in the world buy you the love and affection of a family? How does the latest gadget help you communicate with those who matter? So, please tell me how you define success. If you have time please REPLY to this post with ONE word. Tell me what you think about when you hear the word success. Joshua 1:7 - "Be strong and very courageous. Be careful to obey all the instructions Moses gave you. Do not deviate from them, turning either to the right or to the left. 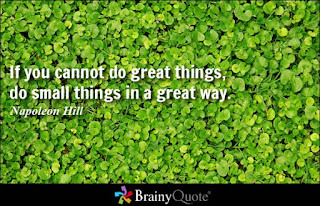 Then you will be successful in everything you do." Do you sometimes feel that God has gone AWOL? 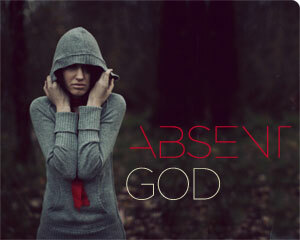 Is there a sense that God is absent from your life? This feeling is actually common amongst us Christians, but we are not comfortable telling others how we feel and so we carry this burden alone. 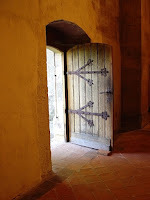 "It is true that our experience of God's presence varies with intensity. Sometimes, usually when we are busy in our daily work, there are occasions when we become aware of the divine absence - not that God has gone away, but that we have forgotten he is there..."
So, it is clear that the 'divine absence' is not really what is going on, because God is with us always. However, we have shifted our attention away from the things of God for a time and so we have become consumed with our own struggles. 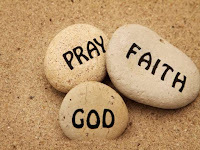 Brother Lawrence then suggests a prayer that we can pray, to help us re-establish our 'connection' with God. Make of me whatever you want." 1 Thessalonians 3:9 - "How we thank God for you! Because of you we have great joy as we enter God’s presence." Remember that God is with you today, even if you feel that He is absent. Oh how we need this to be true in our generation. Please join me as we commit to seriously pray for our people, leaders, children and nation. I believe that only God has the solution we are looking for. As a nation we have tried all kinds of other options, but we can see that these have not worked. I remember how we used to commit to pray at 12 midday during the 'dark' days in South Africa. South Africans, from all walks of life, prayed for peaceful elections in 1994 and for our beloved country. We know that those prayers WORKED. So, why shouldn't our prayers work now? We need to resolve to pray without ceasing. Psalm 85 - "You, Lord, showed favor to your land; you restored the fortunes of Jacob. You forgave the iniquity of your people and covered all their sins. You set aside all your wrath and turned from your fierce anger." I am convinced of this, even though at times it doesn't seem to be the case. Wisdom teaches us that every bleak period we encounter doesn't last forever - the tide does turn. If you have ever gone down to the beach during a Spring High tide you will note how massive the waves appear and how they pound upon the rocks with greater energy and force. One wonders if it will ever be safe to swim in the ocean again. However, if you go back to that same spot 6 hours later you will see a Spring Low tide, which is equalling surprising. It looks so calm and you can wander among the rock pools with ease. It is the same spot, but the Tides have brought about a huge change in appearance. So, take a look around you - what TIDE are you facing at the moment? If it happens to be a High Tide, remember that this will not last forever.... it will change. Hold on for the low tide. 1 Kings 2:15 - “As you know,” he said, “the kingdom was mine. All Israel looked to me as their king. But things changed, and the kingdom has gone to my brother; for it has come to him from the Lord. 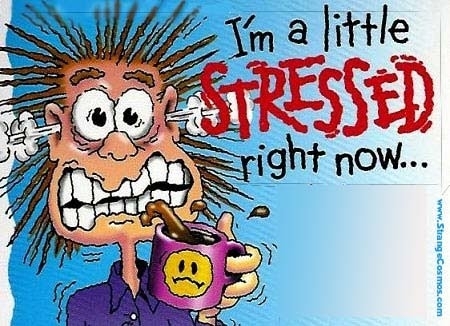 Man alive, exams are stressful .... and I am not even writing any this year! When your kids and students write exams you end up soaking up all their stress - by the end of the week I will feel as if I have been through the mill and back. And that is only when my marking will start!! I keep trying to reason with my students/kids that the role of the examiner is NOT to try and see you crash and burn, but rather to see how much you have applied yourself to the work and to see if you have done the preparation! It never looks good on a Lecturer's record if it looks like this - 35 students wrote the exam and 35 students failed! It makes the lecturer look like a failure too. Obviously, teachers can't give their students the answers before hand, but we do try and prepare and assist students to do the best they can. If the work has been learnt and covered, then usually the tests will be fine. So, how can we relate this to God and faith? Well, when God allows us to go through a time of trial and testing, it is not to take delight in our failure, but rather to see how much we have 'learnt' to put our trust in Him. God could remove all obstacles out our way, but it would not help us in the long run. Admittedly there are a few 'tests' I would rather not be facing at the moment, but we don't get to choose which ones we will face. So, if you are in the middle of exams or facing a testing time, then remember that God is with you. 1 Thessalonians 3:13 - "... so that no one would be unsettled by these trials. For you know quite well that we are destined for them." Luke22:28 - "You are those who have stood by me in my trials." I am enjoying reading (again) Brother Lawrence's book "The Practice of the Presence of God." It is really inspiring. Here is a little snippet from this book. I pray that it may inspire the start of your week. Grace and peace to you. in the midst of your troubles to take solace in Him as often as you can. the least little remembrance will always be the most pleasing to Him. Psalm 16:8 - I keep my eyes always on the Lord. With him at my right hand, I will not be shaken. heaping unbelief in drifts across my life. help me to welcome it." Proverbs 29:25 - "Fear of man will prove to be a snare, but whoever trusts in the Lord is kept safe." In our Sunday services we often pray for our State President and for leaders around the world. 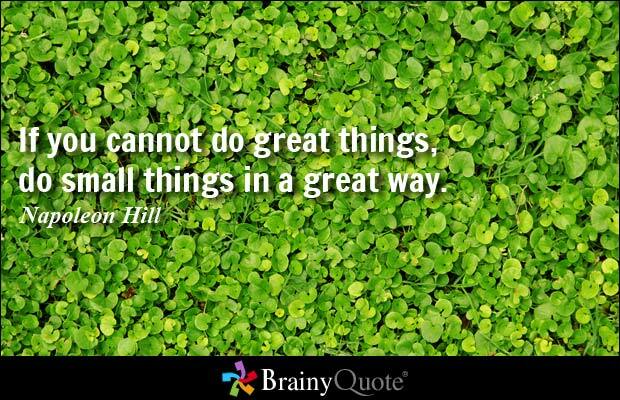 Sometimes it is really hard to do this when I see some of their political decisions and their lack of responsibility and governance. I wish that they would take ownership of their mistakes, but that doesn't seem to be the way politicians work. However, I still believe in the power of prayer and I recognise that every leader is just a human being. President Zuma needs our prayers, regardless of whether I think he is a good leader or not. One of the reasons why I believe the Church should hold Jacob Zuma accountable is precisely because we pray for him. He has asked a number of times for the Church to pray for him, which many denominations have willingly done. But I strongly believe that with pray comes accountability. If I am praying for you and you are still living a life that is off the rails, then I need to hold you accountable. I would expect the same of you, if I had asked you to pray for me. I am reminded of the story in John 8 this morning, where the woman was caught in adultery. It was only Jesus who showed her grace, yet he never condone her actions. He told her to "go and leave her life of sin." I believe Christians in South Africa need to try and find a careful balance between offering grace (perhaps through prayer) to our leaders, BUT ALSO holding them all accountable for their actions. I fully support the Catholic Churches response to the Nkandla issue and I would expect my own denomination to come out with some strong statement soon. Injustice is NEVER RIGHT in the eyes of God. The political spin doctors can try and create wonderful reasons as to why Zuma needs a homestead worth 250 Million, but it will never be JUST in a country like South Africa. Deuteronomy 16:20 - "Follow justice and justice alone, so that you may live and possess the land the Lord your God is giving you." Psalm 11:7 - "For the Lord is righteous, he loves justice; the upright will see his face." So, in the meantime, I ask you to continue to pray for our beloved country, for her people and especially for her leaders. May God intervene and change the hearts of even the hardest of our leaders. Have you ever taken something out of your fridge and, upon tasting it, realise that it has taken on the aroma of others foods in the fridge? This is often with disappointing results. The science of it proves that certain foods will easily absorb the smells from other things. If you leave something for long enough in the proximity of a rotten egg or tomato, it will soon become smelly too. Ecclessiastes 10 - "Just as dead flies make perfumed oil stink, so a little folly outweighs wisdom and honour. A wise man’s heart leads him rightly, but a fool’s heart leads him astray; and when a fool travels, he has no good sense, thus showing everyone that he is a fool. ..."
It works the same in our lives. If we spend a lot of time in the presence of people who give off "bad aroma's" then we will absorb some of their characteristics. If we spend a large portion of time in the company of "great" people, then they will influence our lives in a positive way. So, the next time you open your fridge, think on this - who/what is permeating my world? Are they making my life better or worse? Is it not time to allow the Spirit of God to take up residence in our hearts? 2 Corinthians 2:15 - "For to God we are the aroma of the Messiah, both among those being saved and among those being lost..."
With the growing scarcity of water in our country, people are putting up JoJo tanks to capture whatever rain water they can. It is amazing how much water you can collect off your roof in a single rain-storm. 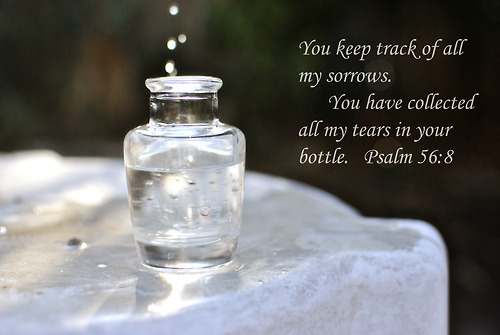 But speaking of collecting water, can you imagine if God collected our tears in a bottle/tank? The Bible actually speaks about how God actually does that for us. store my tears in your water-skin." I find this an amazing thought - don't you? filling up with all your tears. the full harvest of your fears. where He is not aware. and the cause of your despair. are followed up with grief. and sends peace for your relief. as He gathers up your pain. to Him become like rain. with His mercies from above. and caps them with His love.